I was a young buck back in the mid to late 80’s, before grunge became the music of choice to the American youth. I spent a lot of time at record stores and concert halls. Around 1987 I think maybe it 88, damn I am getting to old to remember this crap. Ask your parents I am sure they will explain to you what it is, while rolling their eyes. Warlock had for a lead singer a woman, a young long haired blonde lady, with a great voice. I had seen the video and even picked up their album “Triumph and Agony” before I found out that one of my favorites, Megadeth, was touring and Warlock was opening for them. Needless to say I went. She was fantastic, not only as a singer and front woman, but one of the nicest people I had meet at a band merch booth. Which brings me to a small venue a couple of hours south of me last night. Philadelphia has this concert venue called The Legendary Dobbs, its been around since the early 70s according to their website and they have hosted many bands on their way up the ladder. Bands such as Green Day, George Thorogood and Bo Diddley to name a few. Some really nice people work there, friendliest venue staff I have had to deal with so far. Tuesday night March 3rd they played host to the Metal Queen herself, Doro Pesch. I was able to get approved for a photo pass for this show and made the 3 and half hour trip to Philadelphia with my concert partner in crime, my brother in law Scott. Walking into this place I was shocked, I was expecting something like the Webster Theater in Hartford, but what I found was a bar with 2 stages, one downstairs in the bar area and one upstairs, maybe the size of the Webster Theater Underground and their bar, if both floors were combined. Doro and company were playing the stage downstairs at the bar. I and two other photographers had to fight and jockey for position with a few drunks. Honestly, I probably would do it again if I didn’t have to drive so far to get there, just to be that close to the stage. Doro came out and started working the crowd with what has to be one of the most beautiful and genuine smiles I have ever seen and over the last year I have seen and shot a few of our top ladies of Metal. The Queen of Metal is that for a reason. The evening started off with “Touch of Evil”, “I Rule The Ruins” and “Burning The Witches”, making those of us who are old school Warlock fans happy with that start. Then a little bit of a mix of the old and new with “Fight For Rock”, “Running From The Devil”, and “Evil”. Next up was a new song, “Raise Your Fist”, then one of my favorite Warlock tunes, “When East Meets West” and then “Fur Immer” followed by another song from Hellbound, “Out of Control”‘. Johnny Dee (Formerly of Waysted and Britny Fox) is Doro’s drummer and this was a hometown show for him and at this point he started his drum solo. I had moved back away from the stage, it was already well past my 3 songs, tho I probably could have kept shooting longer. I saw him with Britny Fox back on my 21st birthday opening for Ratt… Another story for another day. Unfortunately due to the size of the venue and the stage…. compounded by the way people were acting, I couldnt get any decent shots of other band members, I hope ya all will forgive, but there will be next time! So I headed out from the front and went to the back of Dobbs by the Merch and sound guy. “We Are The Metalheads” was up after the drum solo, for those of you unfamiliar with this song, she wrote it as a theme song for the Wacken Music Fest in Germany…. One Day, One Day…. “Revenge” and the song EVERYONE screamed along to “All We Are”, will never compare to what I saw at The Gramercy last Oct., hard to top that version. “Unholy Love”, “Hellbound”, “Metal Tango”, “Love Me in Black” and then it was the end of the night and she closed out the set with “Metal Heart”. A really good solid set and performance by all. For the next few weeks they will be working on their 2nd leg of the US Strong and Proud Tour. 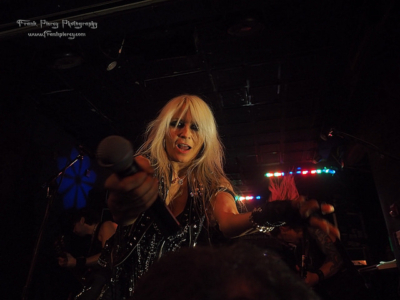 You have just over 2 weeks to try and catch Doro before she heads back to Europe! Doro is something else, smiling through the whole set, full of energy and shaking hands with everyone standing up front. Ticket prices aren’t outrageous and meet and greet packages are so very affordable! If you miss the chance to see her, I don’t want to hear you complain. If you enjoyed this article, please share it along. Photos by Frank Piercy Photography. All photographs are Copyright protected – Not for use without permission.